A great MC bit. Attempting to right a wrong the peformer shows the audience how to switch a card... Literally! Martin's take on the classic vanishing bottle. The delayed climax provides a pleasing ending without insulting the audiences intelligence. Perfect for both children and adults. A very visual card effect for the platform. A card keeps jumping to the face of a pack, which is out of the performers hands. Created by Martin's father Eric Lewis. A prediction effect with built in comedy that leads up to a suprising finale. Easy to customize for different audiences. Each time the outcome is different. The classic Chinese Sticks never had much of a finish until now. This one leaves the audience really baffled. Yes you can make one, it's easier than you think! 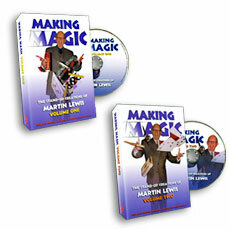 For the first time on videotape Martin reveals all of the details and subtle touches that brings his sketchpad card rise effect into the miracle class.